For the last few years I've been lucky enough to participate in what I believe is an absolute renaissance in the world of wine. The emergence of "fine wine" in Chile over the last decade or so has been no secret to the wine world, however the production of "small lot" boutique wines that can compete with the best wines from Europe and the premium regions of the U.S. is really something to behold. 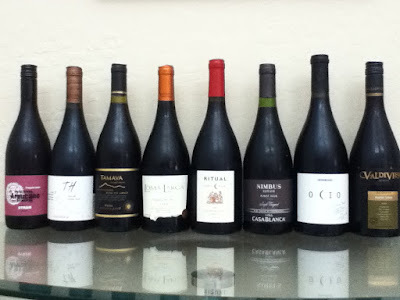 As with the previous Wines of Chile "Blogger Tastings" I was able to take part in an online group tasting of eight Chilean wines with a specific focus. This years event was called "RED RED WINE" - (Cool Climate Red Wines From Chile). 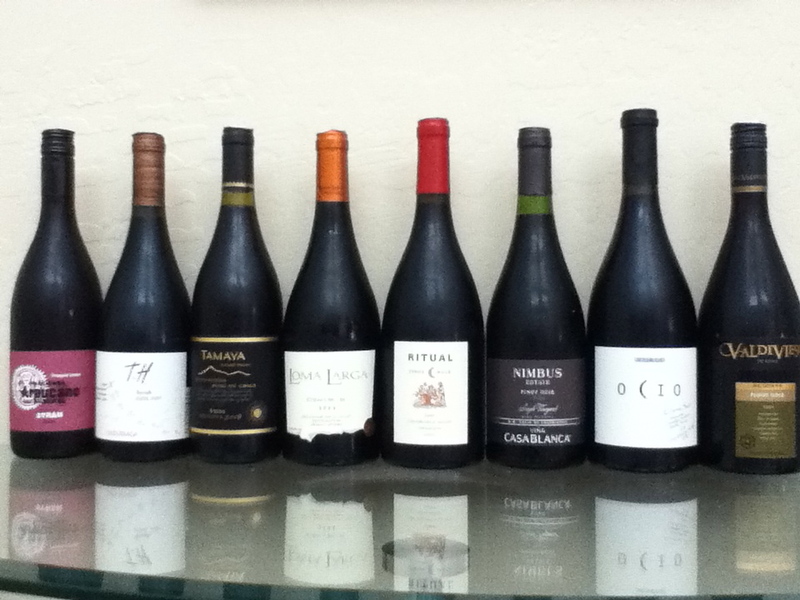 Below is a picture of the line-up which included four cool climate Pinot Noir's and four cool climate Syrah's. I must be frank is stating that this was one of the best tastings I've almost ever been through. Every wine was of considerable quality and 7 of 9 I thought deserved a ninety or better on the 100-point scale. What blows me away even more is that 8 of 9 wines are priced under $30. I must have told my wife at least ten times that I was absolutely blown away by the quality of these wines. Wow! I congratulate all 8 wineries on their amazing cool climate reds! Flavors: rich blackberry, creme de cassis, licorice, and graphite flavors. Chilean wines are amongst my favorite. 2006 Don Melchor Cabernet Conch Y Toro to be exact. I have not yet know what is the taste of sweet red wine. But I'm willing to try it if there is a chance because someone says a wine is also good for our body.